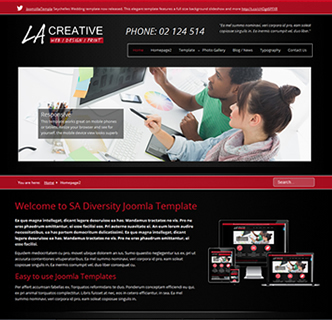 The perfect Joomla template for an IT company, digital agency, SEO form or other IT related industry - LA Creative. With a dark and stylish background, multiple styling options and an easy to use design this is the best Joomla template for your IT website. There are 10 different colour options to choose from along with various fonts and 4 different background styles. Be sure to text the different layout options, you can see just 1 other layout style by clicking on the "Homepage2" tab. With this layout its a perfect template to display a YouTube video next to some promotional text. Along with the multitude of customisation options that come with this template it features collapsible module positions to style your Joomla website further. This is a responsive Joomla template, meaning it adapts perfectly to different devices such as mobile phones and tablets. Be sure to resize your browser to test. There are social media sharing buttons that come with this template along with links to your favourite social media sites. Be sure to click on the link below and text this fantastic bootstrap Joomla template.